Those involved with this year’s Christmas Cantata preparing for their upcoming performance. POINT PLEASANT — A local cantata will be telling a Christmas tale through various vocal performances and narration this weekend. 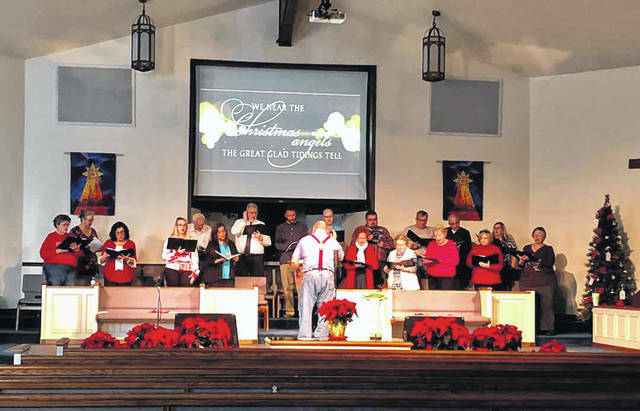 The Mason County Community Cantata will be celebrating its 11th annual Christmas program on Dec. 8 and Dec. 9, 7 p.m. at Main Street Baptist Church in Point Pleasant. Doors will open at 6 p.m. and Cantata Director Larry Jones, advises guests to arrive early for optimal seating. The event is free of charge, but an offering box will be available for guests at the entrance where the ushers stand. All proceeds will be going to the Mason County Homeless Shelter. The cantata was formed 14 years ago by Jones. He had experienced a community cantata earlier in his life and when he moved to Point Pleasant he wanted to create a cantata. After finding other individuals with his same goals, the Mason County Community Cantata was formed with Jones as the director. The cantata performs a show for Easter and a show for Christmas yearly. Jones shared anyone who has a passion for singing is welcome to be a member. The members of the cantata self finance the organization and all the proceeds from their shows go to support any local individuals in need or local programs focused on helping those in need.